Recently, I got a surprise in the mailbox. Usually my correspondence is uninteresting, consisting of the typical bills and junkmail. But to my delight I received an early Valentine from my 3 year-old niece – a Tweety bird looking bashful and requesting the affections of another ecstatic Tweety. Not bad, I thought, for a toddler. How did she know that the season of courting had already begun for birds? Instead of a Tweety-bird, more appropriate for this February Valentine would have been an owl or a raven, because around Revelstoke pairing has already begun for these species. Just the other night I heard a Barred Owl calling along the base of Mount Revelstoke. It’s hooting sounded like someone off in the distance calling “who cooks for you, who cooks for you-all”. During the daytime, I have also heard the soft chortling calls from ravens sidling up to each other on tree limbs. These hardy lovebirds, blind with romance, will soon be managing their young through the harsh second half of Revelstoke winter. Dr. Jen Theberge, recording bird songs near the summit of Mount Revelstoke, on July 2, 2007. Gregg Walker photo. In less than three months, the weather will improve. The raven and owl fledglings will be inundated by birds that are migrating back from Central and South America. Common birds like robins and swallows. Persistent singers like winter wrens and hermit thrushes. Birds with one springtime motive – find a mate and establish a nesting area as quickly as they can. To birds, Valentine’s is not just one day consisting of chocolate and a movie; it is an entire season of love. In these national parks we await the return of one species in particular, the Olive-sided Flycatcher. It is a drab, sparrow-sized bird that perches on the tops of mid-slope trees. It is known for its distinctive call that sounds like “quick three beers” to mark its territory and attract a mate. This phrase, perhaps not so romantic between humans, apparently represents significant charm and allure to Olive-sided Flycatchers. We will be watching for Olive-sided Flycatchers because their population status is considered to be “Threatened” (same as mountain caribou), and subsequently require protection, under the Species at Risk Act. During systematic searches in the past two years I have heard only a few individuals. But existing historical data is not sufficient to conclude whether their numbers have declined substantially in the national parks. Reasons for their apparent decline are not clear, but possibly mortality is high on their southern wintering grounds where habitat is being lost at a rapid rate. Closer to home, in North America, these flycatchers establish spring territories near forest openings. Evidence suggests that while they sometimes use openings created by logging, their nest success is not as high as in clearings created by fire. By observing birds, such as this flycatcher, we can be forewarned of problems regarding the health of the environment. This is because the great diversity and specialization held by birds makes them sensitive to changes in the environment. For example, some species are sensitive to changes in climate, pollution, insect populations, fragmentation, or disturbances created by people at local to global scales. These changes in the environment often indicate environmental impacts that degrade long-term sustainability or even human health. Consequently, songbirds are widely recognized as a valuable indicator in monitoring impacts on ecosystems and biodiversity. In the Revelstoke region, there is a suite of bird species that may provide early warning signals regarding ecosystem health. 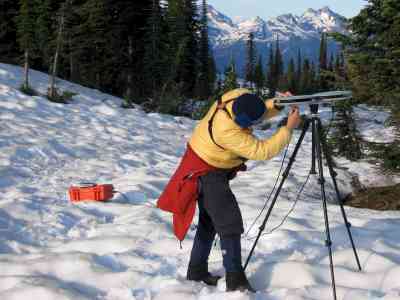 To catch these signals, a monitoring program has been established in Mount Revelstoke and Glacier national parks. Each year, at 100 stations, we collect 10-minute sound recordings as samples of the vocal bird population, and these are later analysed by specialists. Over time, we can detect if there are significant changes in songbird populations and identify ways to mitigate impacts to the environment. Iin June, as in the past two years, a small research team will be staggering out of our beds at 3 a.m. to record bird presence on their breeding grounds. It is interesting and rewarding field work to listen the dawn’s outburst of song – that is if you can shake the discomfort of wishing you were still asleep. For opportunities to join us on a bird recording excursion in June 2009, contact the Parks Canada office at 250-837-7500. Looking for another way to enjoy the lovebird serenade? Step outside, take a deep breath, and listen… anytime from Valentine’s Day until July! Dr. Jen Theberge is the Wildlife Ecologist for Mount Revelstoke and Glacier National Parks of Canada. She has conducted wildlife research in protected areas across North America for 20 years.